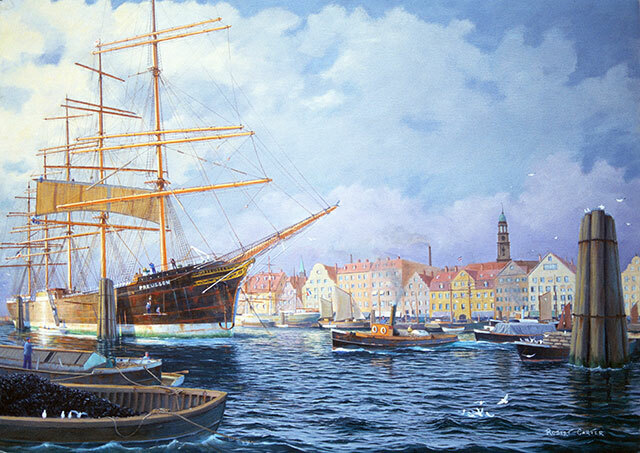 Preussen, the pride of the Laeisz fleet was, the only 5-masted full-rigged ship ever built. 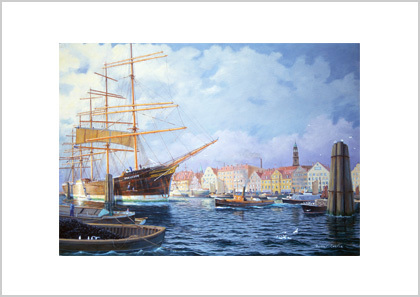 This painting is a reconstruction of the Elbe waterfront with the host of smaller craft that plied the North Sea and beyond. I walked along this waterfront in 1957. There was still considerable evidence of the devastation from wartime bombing. There were vast open spaces where these quayside buildings had been but St. Michaels Church, whose spire can be seen in the painting was still standing. I had to rely on photographs that I took of still-standing buildings and photographs of pre-war Hamburg. In port, sails were usually unbent for various reasons. Firstly, there was no reason to expose them unnecessarily to sun, rain and snow, even though they were exposed to these conditions in their normal working life. They also needed repairs – patches, whole cloths, boltropes, cringles, etc. had to be renewed. Removing the sails made it easier for masts and yards to be painted. If sails were not unbent it would be necessary to unfurl them, (shake them out), to dry them after rain, that is, if the wind was not too strong. In this painting, a new topsail is being stretched. The sailmaker and his assistants would have made this sail while the sailer was in the tropics, ie. the trade wind belt and doldrums, when it was possible for much maintenance work to be carried out. It is now being bent onto the yard to check if it sets to the sailmaker’s liking. The term ‘stretching’ was used but it only meant that the head was pulled out to the end of the yard as rovings were tied on. The sail makers ‘assistants’ would be several of the crew who showed an aptitude for stitching. Most of the sailmakers in the last sailing ships, learned their trade in this manner. The period that this painting depicts, would have been between 1902, when Preussen was built and 1910, when she collided with the cross channel steamer Brighton, in the English Channel. This was the premature end to a magnificent vessel, through no fault of her own. Brighton misjudged Preussen’s speed and attempted to cross her bows. With her rigging damaged, Preussen became uncontrollable and in spite of two tugs, drifted ashore at Dover. She could not be floated off and this is where she remained until her bones sank into the sands. Preussen, the pride of the Laeisz fleet was, the only five masted full rigged ship ever built.